What Are the Uses & Benefits of Alpha GPC? How Do I Take Alpha GPC? How Do I Pick a Good Alpha GPC Product? In order to help you find a good alpha-GPC product, we’ve narrowed down the best alpha-gpc supplements on the market right now. NOW Foods Alpha GPC offers a good alpha GPC dosage delivered in vegetarian capsules free from gluten and many other allergens, such as milk, egg and fish. At 300mg per capsule taken twice daily, this high-quality alpha GPC supplement is a good choice for many. NOW Foods is a natural health supplement producer that was founded in 1968, and has sustained a reputation for quality, purity and potency in its products. The company uses mostly non-GMO, organic ingredients, and offers a large variety of health products. This is the best alpha GPC supplement on the market right now, and its positive customer reviews show it’s well received. It has a good alpha GPC dosage that is vegetarian and free from gluten, and it is made in a GMP certified facility by a reliable brand. 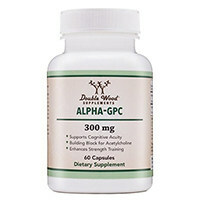 Double Wood Supplements Alpha GPC is a pharmaceutical grade alpha GPC supplement taken in 300mg doses twice daily. It is manufactured in the United States and boasts a 100% money back guarantee. Double Wood Supplements is a Philadelphia-based supplement brand offering extracts, essential nutrients and amino acid products. The company makes all of its products in the U.S.A., and tests them for purity. This tested, pharmaceutical grade alpha GPC supplement is one of the best, and the manufacturer knows it. They are so confident in it that they offer a 100% money back guarantee. It offers a good alpha GPC dosage of 300mg twice daily. 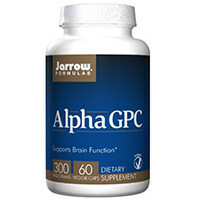 Jarrow Formulas Alpha GPC is a vegan and vegetarian alpha GPC pill offering 300mg per capsule. It is made free from many allergens, especially gluten. It has 60 servings per container of top-quality alpha GPC capsules. Jarrow Formulas was founded in 1977 alongside a small health foods store located in West Hollywood, California. Today, the company has grown to offer large variety of dietary supplements made in GMP certified facilities. Made in a GMP certified facility by a reliable manufacturer, this high-quality alpha GPC supplement provides 300mg capsules free from gluten and other allergens. It is vegan and vegetarian, and well-reviewed by consumers, making it one of the best alpha GPC supplements on the market. VitaMonk Alpha GPC Capsules is manufactured in a GMP certified facility and its ingredients are guaranteed to be 100% premium quality. It offers a 325mg alpha GPC dosage per capsule, with a total of 60 servings per container. VitaMonk is a health supplements brand that uses traditional health practices and medical research to guide its product formulas. 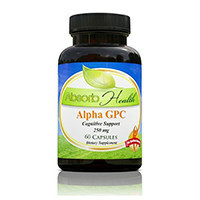 With 325mg per capsule and 60 capsules per container, this 100% premium quality alpha GPC supplement is a good choice. However, it includes rice flour filler. Absorb Health Alpha GPC provides 250mg per capsule of alpha GPC, made in a GMP certified facility free from cutting agents. Absorb Health is a newer supplement brand that was founded in 2011 when founder Josh Fulton tried to help his wife Katrina after she fell ill. He saw that many natural supplements could be priced more affordably, and Absorb Health was born. This alpha GPC pill offers a lower dosage than most, but it is made in a GMP certified facility using high quality ingredients. It is a bit pricier than some alternatives available on the market. 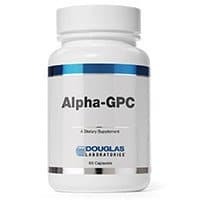 Douglas Laboratories – Alpha-GPC offers 250mg alpha GPC taken twice daily. It is made free from GMOs or gluten, and it does not contain any artificial preservatives or flavors. Douglas Laboratories started in 1955 with nutrition pioneer Sam Lioon, who began selling nutritional supplements directly to healthcare professionals. Today, the company offers a variety of products available to consumers as well. Made with good alpha GPC and free from gluten, GMOs and many artificial ingredients, this is a top alpha GPC supplement. However, it offers a lower dosage per capsule then many alternatives, and it costs more. 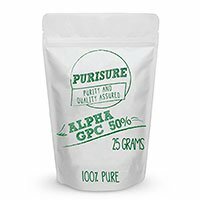 Purisure Alpha-GPC Powder is a powder rather than a pill. It is a 50/50 blend of alpha GPC and silicon dioxide, a commonly used pharmaceutical and supplement ingredient that prevents the powder from sticking together. Purisure is a natural health brand offering mostly nootropic supplement powders. The ingredients used are pure and sourced from around the world. The company offers a money back guarantee. This powder alpha GPC supplement offers dosing flexibility, and a great price point. However, it is half silicon dioxide, which is not necessarily beneficial. 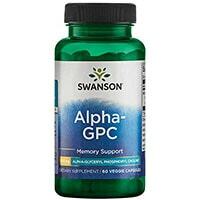 Swanson Alpha-GPC is a vegetarian supplement offering a good alpha GPC dosage of 300mg per capsule. It is manufactured in a GMP certified facility, has guaranteed purity and potency and is supported by a 100% money back guarantee. Headquartered in Fargo, North Dakota, Swanson Vitamins is a dietary supplement brand that was founded in 1969. Its products are science-backed and provided at value prices. This basic alpha GPC pill provides vegetarian pills made in a GMP certified facility using guaranteed potent and pure alpha GPC. The company offers a 100% money back guarantee. However, it does include unnecessary added ingredients. Pure Encapsulations – Alpha-GPC is a potent alpha GPC supplement. It is recommended to take two capsules three times daily for a total of 1200mg per day. Pure Encapsulations specializes in hypoallergenic health supplements developed using medical research and designed to deliver predictable results. The brand is trusted by medical professionals. One of the highest quality alpha GPC supplements available, this is also one of the most expensive. It’s a potent alpha GPC supplement, and recommended to take two pills three times daily. However, there are only ten days’ worth of pills in one container. 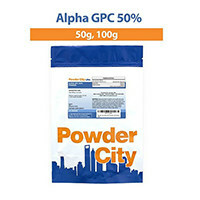 Powder City Alpha GPC is half silicon dioxide, half alpha GPC. It offers 300mg of alpha GPC per serving, using guaranteed pure ingredients that is verified with third party laboratory testing. Powder City offers bulk dietary supplements and nootropics to over 250 thousand worldwide. The company was founded in 2014. Offering 300mg alpha GPC per serving, this supplement is a good option for many. It is third party lab tested and made with guaranteed pure ingredients. However, it isn’t pure alpha GPC, it’s half silicon dioxide. Alpha GPC is a compound found in food that the body uses for supporting basic health systems in the brain and nervous system. There is a some promising research on alpha GPC’s benefits to human health, but more research is necessary. Cognitive support: Alpha GPC supplements provide a high choline content, which is an important nutrient for cell membranes. It acts as a critical component of the cell membrane and supports cellular structure. (6) One large, double-blind study lasting over six months showed that alpha GPC supplements at dosages of 400mg taken three times daily in persons with mild to moderate Alzheimer’s disease notably improved symptoms. The study included 261 human subjects of both genders in a placebo-controlled trial. (7) The same study showed that the rate of cognitive decline was significantly reduced. Athletes: There is some interest in the use of alpha GPC supplements for enhancing production of growth hormone in athletes. Growth hormone can improve body composition (fat vs. muscle percentage by mass) and can support maximum power output. (8) One study found that seven trained men saw a 14% increase in power output, as well as an increase in exercise-induced growth hormone, when supplementing with 600mg alpha GPC prior to exercise. (9) However, this study was funded by the company that produced the alpha GPC product being tested, so results might not be reliable. When taken at appropriate dosages, alpha GPC is a safe supplement. However, some people may experience side effects such as heartburn, headache, insomnia, dizziness and skin rash. 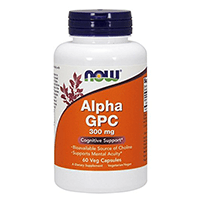 Good alpha GPC supplements offer quality dosages of around 300mg minimum per serving. They are also made by reliable companies with good reputations. Check the ingredients list on the back of alpha GPC supplements to make sure it does not contain unnecessary or harmful added ingredients.